Beers in the Shower: What'll You Have? I'll admit it, I'm a beer guy. Not in the microbrew kinda way either. I was raised in a house that had a separate fridge in the basement just for beer. Mainly it was Budwieser. The macro of the macrobrews. Collecting schwag became an early hobby as around raceday all the corporate sponsors would plaster their plastic banners everywhere that they could in the neighborhood and being the kids we were, we would swipe them and hose em down and use them as slip-n-slides. Who says advertising doesn't work? In my time behind the stick I have gotten pretty good at mixing it up and serving some delicious cocktails. Still when I get home I'm usually cracking a Pabst Blue Ribbon. The original brewery was founded as The Empire Brewery, later Best and Company, in 1844 by the immigrant German brewer, Jacob Best. The brewery was run by Jacob, Sr. and his sons Phillip, Charles, Jacob, Jr., and Lorenz; Phillip took control of the company in 1860. They started the brewery on Chestnut Street Hill in Milwaukee with a capacity of 18 barrels (2.9 m3). Later, in 1863, Frederick Pabst, a steamship captain and son-in-law of Phillip Best, bought a share in Best and Company, by which time the brewery was already selling a lager which they began bottling in 1875 under the name Best Select. Best Select became a popular beer, which the by now named Phillip Best Brewing Company entered in competitions, gaining several awards - sometimes winning against its rival Budweiser. So in 1882 the company started selling the beer with a blue ribbon tied around the neck to signify it was an award winning beer. In 1889 the name of the brewery was changed to Pabst Brewing Company. And 1895 brought additional honors when Pabst became the first U.S. brewer to hit the million-barrel per year mark. 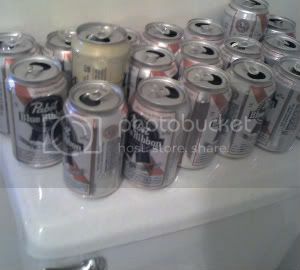 The beer was so successful that Pabst began ordering millions of yards of blue ribbon. One factory in 1902 worked around the clock for nearly a year to complete a contract for 10 million yards of ribbon. When Fredrick Pabst died on New Year's day of 1904 he left control of the business to his sons Gustav and Fred Jr. In 1906, the Pabst Brewing Company first began to use caps on bottles instead of corks. Growth continued up to Prohibition when alcohol production was made illegal. Fred Jr. and Gustav successfully guided the company through the discouraging years of prohibition by switching to malt syrup, tonic, cheese and near beer. When the beer returned to the market in 1933, minus the blue ribbon, it quickly became a national brand brewed in several locations across the country. In 1935, Pabst was the second brewer, following Krueger Beer, to put beer in cans. Called "Export", the cans came with a picture of a can opener on the side, with opening instructions. During World War II all cans of Pabst Blue Ribbon were painted a military green and were exclusively made for the troops because of tin rationing. During the 1950’s, Pabst sponsored boxing on CBS, a detail that can be seen in vintage footage of some of Jake LaMotta's fights used by Martin Scorsese in his classic film Raging Bull. In 1958, with an annual production of 3.9 million barrels (620,000 m3), Pabst Blue Ribbon had now sold a total of 100 million barrels (16,000,000 m3) since first being brewed, an event commemorated by adding the red stripe to the logo. Annual sales figures climbed each year, helped by Pabst cutting the price of the beer, until it reached a record high of 18 million barrels (2,900,000 m3) in 1977. Although impressive, Budweiser had achieved the same output nearly ten years earlier, and would never again see Pabst Blue Ribbon as a competitor. Although it had fallen from the number one spot, the brewery continued into the 1960's as one of the country's top producers. Pabst was also renowned in Milwaukee for its brewery tours. A statue of King Gambrinus welcomed visitors, who gazed upon a vast, beer-filled warehouse as they were informed that another, equally-sized warehouse sat in the basement--for distribution to Wisconsin alone. Visitors to Pabst's tour were rewarded with sometimes bottomless glasses of beer at its end-of-tour Sternewirt Pub. Complete with a statue of Captain Frederick Pabst and waitresses pouring from pitchers of Pabst Blue Ribbon, Pabst Dark, and Andeker, the pub was popular with both tourists and locals, especially students from nearby Marquette University and the University of Wisconsin-Milwaukee. In 1983 it purchased another famous name in U.S. brewing, Olympia (Another of my favorites - I have an Oly Horseshoe tattoo). Then in 1985 Pabst itself became a takeover target when it was absorbed by General Brewing. By the 1990's Pabst was once again positioning itself to regain former glory as it became one of the first foreign brewers to set up operations on the Chinese mainland. Pabst then entered a period of poor management and decline. After several messy years spent fighting corporate buyouts, Pabst was sold for $63 million to Paul Kalmanovitz in 1985. Advertising stopped. Quality dropped. Drinkers turned elsewhere. At the time of Kalmanovitz’ death in 1988 it seemed like the brewery would have to close, but Lutz Issleib took and kept the Pabst brand alive, although production was fairly static. In 1997 one of the saddest chapters in Pabst's proud history was written. Facing the cold reality of bleak financial performance at its flagship brewery, it closed all Milwaukee facilities—brewery and headquarters. A century-and-a-half after its birth the last barrel rolled out its fabled doors. One of the last of the major Milwaukee brewers, Pabst suffered during the 1980's from an ill-fated dichotomy; the very essence of its success was bound to sideline the brewer from volume competition with Budweiser and the other major American brewers of the 70's. Pabst's Milwaukee brewing process, with a death-grip on tradition, quality, and the "old ways" which made it famous, was in stark contrast to its major competitor, Budweiser, who chose to mass advertise, diversify, and field several modern breweries nationwide outside St. Louis. This antiquation eventually brought the end to Pabst market share and, eventually in 1997, its Milwaukee operations. Two major events in the beer market revolutionized the mass beer market from 1970 to 1990, none of which Pabst fully participated in. To understand the context of these changes, it's important to note the top selling beers in 1970 in contrast to twenty years later in 1990. The top beers (sales - U.S.) in 1970 were 1) Budweiser, followed by Pabst Blue Ribbon, Schlitz, and Miller High Life. By the 80's, the market had been totally re-invented due to the advent of "Lite" beer by Miller and subsequent light beer additions by other brewers. Furthermore, a federal judge had ordered Coors Brewing Company to expand its operations outside of the Rocky Mountain area, forcing Coors to ship their product east of the Mississippi for the first time. The resultant reordering of beer sales by 1990 stacked up with Budweiser still on top, followed by Miller Lite, Bud Light, and Coors Light. Only Budweiser had remained from the original hierarchy, and was the only "non-light" beer remaining on the listing. Pabst had not followed the media frenzy of its major competition, and its choice to not advertise coupled with its staunch adherence with tradition (note how many times other beers change their labels, for instance) gave rise to a grass roots revival later in the next millennium; a resurgence in market share of which Pabst is now fully enjoying. Cheap beer drinkers of the world unite! Politics Scmolitics. Its too confusing. Apparently cocktails are becoming popular.